John Schroer was appointed Commissioner of Transportation by Governor Bill Haslam in January 2011 and served until December 2018. He was the 29th commissioner of the state agency that oversees a statewide transportation system including highways, rail, airports, waterways and transit. 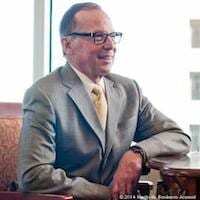 On the national level, Schroer served as the 2017/2018 President of the American Association of State Highway and Transportation Officials (AASHTO), an organization composed of peers from all DOTs across the nation. In this leadership role, he focused on sustainable transportation funding solutions and ensuring states are prepared for emerging transportation technology, such as autonomous vehicles. Schroer received a bachelor's degree in business from Indiana University and an MBA from the University of Tennessee. He spent ten years in the commercial real estate financing business before beginning a real estate development business in Franklin. Schroer and his wife, Marianne, have three children and one grandson and live in Franklin Tennessee.